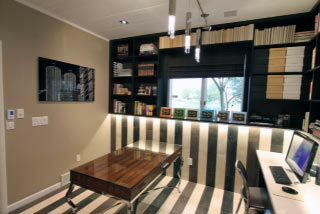 Stripes are a fun addition that can add visual interest and depth to any room of the home. 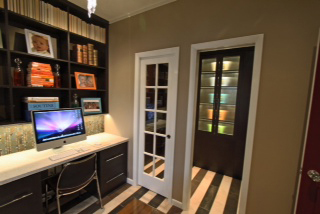 This homeowner loves the energy and vivacity stripes bring to this home office. The attractive table desk in the center of the room is high on style and great for projects and things that need tabletop space, but offers virtually no storage. Closet Works came to the rescue by adding abudant shelving on the walls and surronding the window. A wall-to-wall two person credenza with file drawer storage was also added to accommodate multiple workers. Example of a home office space with multiple work stations and stylish office organization options that offer a contemporary aesthetic that is also high on function. 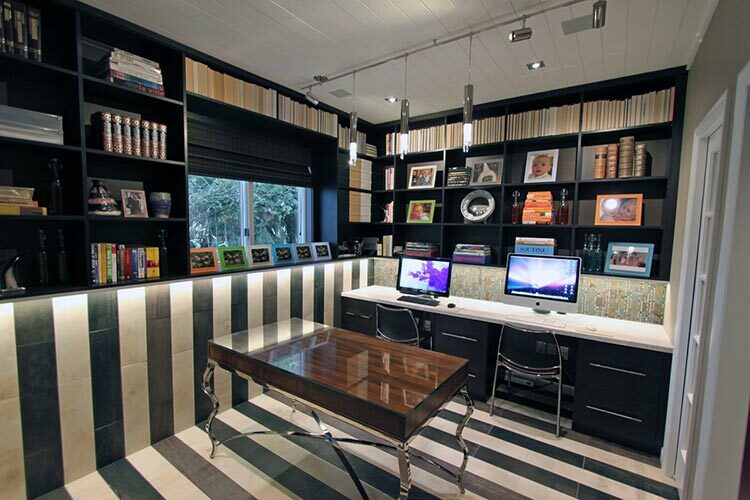 This contemporary home office design mimics the décor used elsewhere in the home. Open shelving offers plenty of storage and surrounds a window with a matching window treatment.